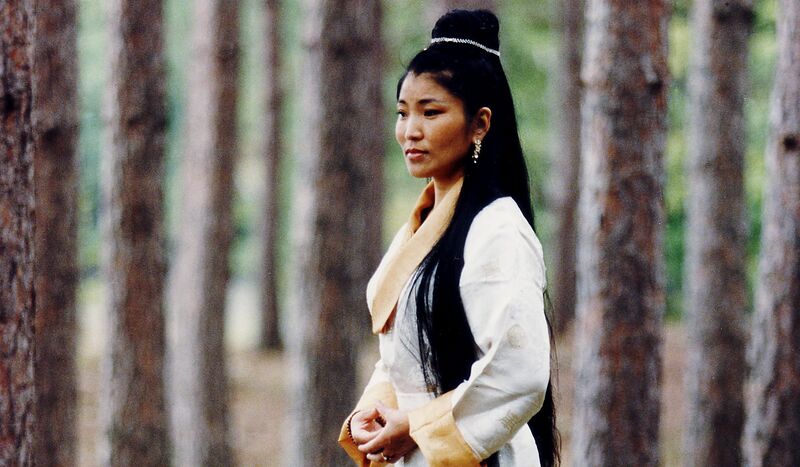 Yungchen Lhamo’s voice is an instrument that needs no adornment, a rich soprano of impossibly clear tone, with a light touch that belies a potent flow of energy. It can skip, low and unhurried, down impressionistic pathways that nod to the Buddhist mantras of her native Tibet; it can surge, swift and quavering, into pious cries bordering on wails. Most often delivered a cappella, it has entertained the Dalai Lama and Bono; dueted with Natalie Merchant, Annie Lennox and Billy Corgan; and won a landmark international music award. On a sunny June afternoon in Kingston, New York, a sleepy, sun-bleached town about two hours north of Manhattan, this voice fills a small, 15th-century Dutch church. It’s part of a musical play called You Are Beautiful, I Am Beautiful, and Lhamo is sharing this stage with 13 residents of Chiz’s Heart Street, a local homeless shelter for the mentally ill, most of them schizophrenic. Almost all of her actors are dressed in drag: The men wear long sundresses and shiny acrylic wigs; the women sport dark suits and smudged, drawn-on mustaches. They chant a song Lhamo wrote for them—a simple, pious, keening tune, also called “You Are Beautiful, I Am Beautiful”—and pace the narrow central aisle of the church, through their 100-person audience, grasping hands and beaming up at the vibrant red and yellow streamers draped for the occasion. In Australia, she released her debut album, Tibetan Prayer (1995), which merged folkloric rhythms with melismatic Buddhist devotionals. It won an ARIA Award (Australia’s equivalent of a Grammy) for best folk/world/traditional music album and made her the first Tibetan musician to ever win a high-profile mainstream music industry prize. Peter Gabriel signed her to his Real World Records, and she began enjoying rarified air: performances at Carnegie Hall in New York and the Louvre in Paris; inclusion on the Hollywood soundtrack to Seven Years in Tibet; pairing with Annie Lennox on Lhamo’s disc Ama and Natalie Merchant on that singer’s 1998 album Ophelia. Those efforts earned her reviews with words such as “exquisite” in The Guardian and “brilliant” in The New Yorker. Lhamo brushes off such praise. “I don’t believe so much in myself as a singer. For me, this is about medicine, using your energy to make the world an offering,” she says. Now in her mid-40s, she resides in Kingston to be near the Manhattan world music venues she headlines. Lhamo’s modest musical play was the product of her charity work at Chiz’s Heart Street, and a visibly daunting experience for its actors. Many at Heart Street have struggled to interact with society; some languished, comatose, in psychiatric wards, and another spent time in prison for murder. While they flanked Lhamo before the church’s ornate pulpit, their expressions shifted gradually from bashful to assertive as they acted out a playful arc about a family reunion. Then they shifted to autobiographical tales about their lives, the most turbulent anecdotes mumbled with downcast eyes: stories of broken families, drug addiction and physical disabilities. Throughout these performances, Lhamo embraced her actors maternally, light rippling over her sequined lilac chuba (a traditional Tibetan robe) and the peacock-shaped rhinestone clip pushing back her knee-length black hair. Lhamo began volunteering seven months ago at Chiz’s Heart Street, a pretty trio of converted Victorian homes near downtown Kingston. The boarding house generally houses 45 to 50 residents and is run with precision by Mary “Chiz” Chisholm, a former engineer and Vietnam War veteran with close-shorn white hair who monitors meals and medicine intake with empathetic vigor. Her work has been honored by the New York Senate. On Lhamo’s first visit to Heart Street, she sang to a timid, unresponsive audience. She returned unprompted the following week and has visited almost every Wednesday since. In those months, Lhamo’s interactions with the residents bloomed from quiet conversation to dancing and singing—and, ultimately, putting on the play that would give the patients’ newfound identities a real-world stage. In the past decade, Kingston’s community of mentally ill homeless individuals has surged. Gallo says Benedictine Hospital counts over 2,500 behavioral patients—more than one-tenth of the town’s population, according to the last census report, and a byproduct of New York state shutting down many psychiatric facilities over the past decade, a move related to the $5 billion in cuts made to mental health services nationwide. The mayor calls his town a “dumping ground of deinstitutionalized patients” and says many of them end up on the streets or in unethical shelters. Across the country, diagnosed schizophrenics and other people with severe mental illnesses are often treated entirely with heavy regimens of antipsychotic medications that pack myriad adverse side effects. “You take into account how we’re treating these patients now—it’s like, ‘Here’s your meds, go stare off into space or look at the TV.’ There’s something barbaric and inhuman about that,” says Gallo.